Its fun to tech cards once in a while. You will just love that face of your opponent whenever he sees a card that isnt supposed to be in a certain deck. It causes the element of surprise which is very good. A card that has caught my eye is psycho jumper. Psycho jumper is a tuner. Which makes it a plus one =) its also psychic type and that makes it searchable by emergency teleport! Its not these little stats that made this card eye-catching. 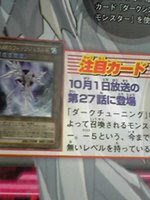 Its the fact that it can switch control of a psychic monster on the field with an opponent monster for a mere 1000lp. If my opponent had to choose the monster that he was giving me then it would make this card sucky. However it lets you choose the monster! With commited fields in the Meta now from stardust and red demon and goyou and dark end ruling the playing field it would be a shame if u lost your monster that u had done so much just to bring out. In fact it would be more of a shame if the monster wasnt destroyed but instead shifted control to the oponent! brainwashing does the job well but then its limited to one per deck =( and mind control forbids the monster that u just took to be tributed ot attacked. Now thats a very big disadvantage if you have no tuner to call out. psycho jumper lets you take it like a tragoedia. Its not hard to give your opponent a psychic monster. Psychic decks just love this card. Besides its not all bad since the average DAD deck plays at least 3 to 4 psychics ranging from clevonse to psychic commando and even mind master! Mind master would be so good to give to your opponent and watch his face turn blue as you steal his biggy =) Psycho jumper would be good tech and i would like to try it out just for fun anyway. Its good as its still a lvl2 tuner just like a clevonse. There is nothing to look down upon this lil smiley face dude. 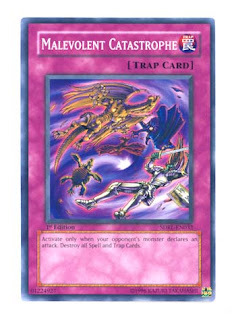 In most decks synchro cards happen to be the most hard to take down cards. Is stardust bothering you? or that big goyou guardian that keeps on stealing your monsters? Or even Gladiator beast heraklinos? 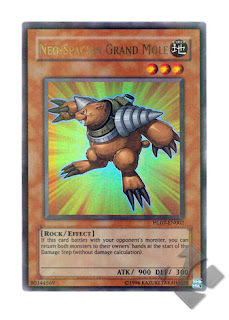 Anything that is bothering you on your opponent field can be taken down by Neos grand mole. In all 3 duels, i lost a stardust, Red demon dragon and a dark arm dragon to this stupid little rodent. Next up is a card known as creature swap. Off all cards i chose creature swap. Why? firstly i think its because recruiters are seeing a comeback in this format. With mystic tomato being run in many dark decks and even mask dragon in Hopeless dragon, and other decks like ratbox or stuff, creature swap is your best friend. 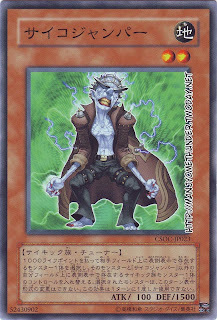 Dont forget goblin zombie =) it gives it to yr opponent. Then summon yr zombie master n play creature swap targetting goblin and get your opponent's card, Then attack it and fetch your carrier. =) IMO its still better than psychp jumper cuz u don nid to sacrifice a psychic. DAD decks have a field clearer such as DAD, other spells/ traps. Although magicians dont have tuners its not all a goner. You can have teleport and clevonse/mind master/pyshcic commando combined all together. attack strength isnt a problem either with cards like skil black magician with 1900 atk and dark magician with a 2500 atk. 2500 is enough to kill Stardust. 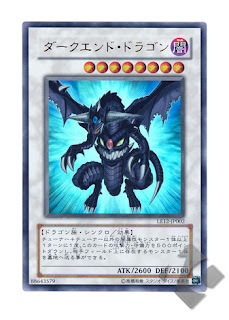 In fact with the sudden craze in dragons (stardust, red demon, dark end bla bla) you can run buster blader in there too for pure fun. Buster blader is no goner because there is skilled white mage to bring it out. 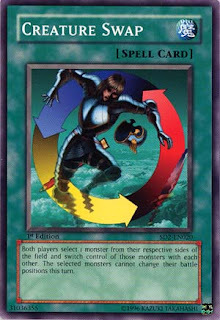 Although a simple goyou can take it down thats why the decks should pack book of moons, e-cons, and many other trap cards even dimension prison and phoenix wing wind blast are all good stuff to pack. Compulsory evacutaion device is excellent in there as it returns anything without a discard cost which the magician deck doesnt need any card in the graveyard. They have a one-sided imperial order!!! The DAD deck just stops right there. Allure cant move, the dheros cant be discarded, the reinforments cant move either. GB cant play their book of moons, and stuuf like that. iN TCG lightlords cant play charge of the light brigade. Also, solar exchange cant be played. =) how good is that? Most decks nowadays are focused onto speed speed and more speed. But what is speed with out control? You could run 3 ddraws 3 allures n 3 or any speed card in your deck just to draw it out but with no control? What use is that? If you look at the top decks GB, Lightlords, metabeat(nt really top but owns fast but too expensive so =/) and the new DAD teleport they are all about control. While in the TCG ppl are still playing 3 d-draws i can see that the OCG is changing. The recent MH cup played on Duel Online i think top 3 decks were (in order) Light undead, Tele DAD with undead and Gladiator beast teching 3anti-spell fragrance! I think now we can see that the spell fragrances make a great GREAT tech as it so kills Tele DAD which needs spells to function fast. ith 3 dd crows, 3 spell frgrances and 3 compulsory evacuation devices the GB deck just slowed down the Tele-DAD duelist by a Hell lot!!! As much as i hate to say it, it looks like GB is innovating n MIGHT just be on par with teleport-DAD now. I think we come to a conclusion here that control is more important than speed. I have cut the d-draws from my deck and reduced the allure number to two. Michael Santoso(baha) is doint it too he removed draws from his deck and added raio and more stuff tech to his DAd tele deck. While speed alone is important if we can simplify the game i think we can make a sacrifice here. Of course dont FORSAKE speed. Still run 2 to 3 allures, dark grepher, reinformcents, urgent teleport n stratos. Its that easy. U still have speed there. Today's post trys to tell u that speed n simplifying the game is equally important. Having both in the deck is best. Numbers seem to be one of the most important things in the card game. Its involved in life point count, time count n most importantly : Synchros. If i just write on the main content i think the post will be too short. So im gonna talk abt numbers for just a few paragraphs. In yugioh, the most important thing is to nvr act recklessly. In any circumstances you must never play simply unless you r very sure that u have lost the game and in that situation there is no use to simply play anymore anyway just scoop. 3) unequip n then reequip each turn for a (-2) from yr opponent each turn! Wicked! Anyway in Japan ppl r crazyily summoning [AOJ catastor] as this guy just kills any non-dark deck. So bye bye Lightlords and so long GB ! (damn test tiger larh), His advantage is just awesome and actually lvl 5 isnt hard to get at all. You can use [necro gardnar] as your lvl 3 to pair with carrier or teleport. You can use [psychic commando] as your lvl 3 tuner n another lvl2 card(i dono wad) Its actually easy to get out Haha. Anyway the real conclusion is that Level 6 summonings arent that popular anymore. 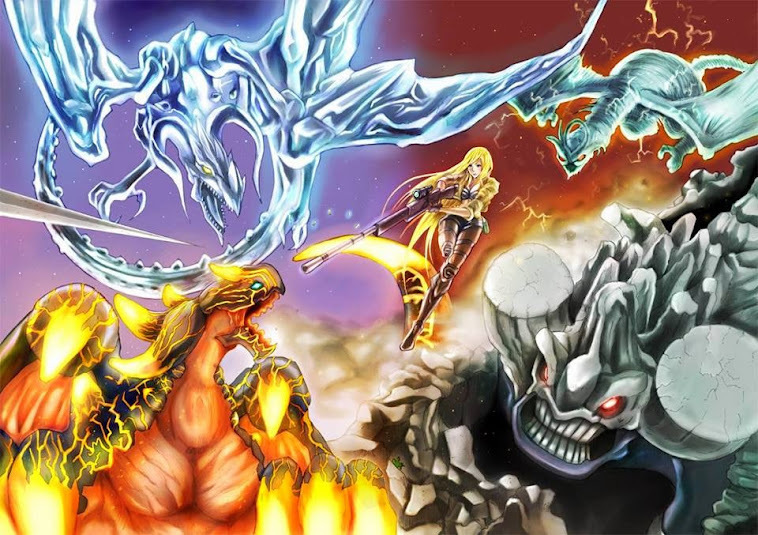 while Goyou guardian remains gold, since the banning of [premature burial], i dont think ppl are so focused to summoning their [briunac dragon of ice boundary]s anymore. Stardust and Thought Ruler are not so consistent in the OCG. A stardust and a red demon on the first turn or stardust and dark end might just be the delinquent duo for the tele-DAD decks. Use your [d-hero malicious]es wisely!!!! Side topic #3: Synchro mechanic might change again. If u hav been keeping up with the YGO 5ds anime u will know of [freezing fritzgerald] a new synchro monster (dark synchro actually) that is used by the mysterious man with the spider birthmark ( following the Nazca lines spider). Lololol check out the picture of the cards here! : http://www.janime.info/5DS/series027.html or simply go to youtube n type "yugioh 5ds episode 27"